Preheat oven to 180°C/350°F. Quarter and core pears and slice the quarters into thin slits. Peel and halve the shallots. Set both aside. Season both sides of the pork chops with salt. Transfer to a hot grill pan and grill on all sides, for approx. 10 min. in total. In a second pan, heat the butter and olive oil and add sliced pears, shallots, and thyme sprigs and sauté for approx. 5 min. Season with salt and pepper. Add the orange liqueur and let simmer for approx. 30 sec. more. 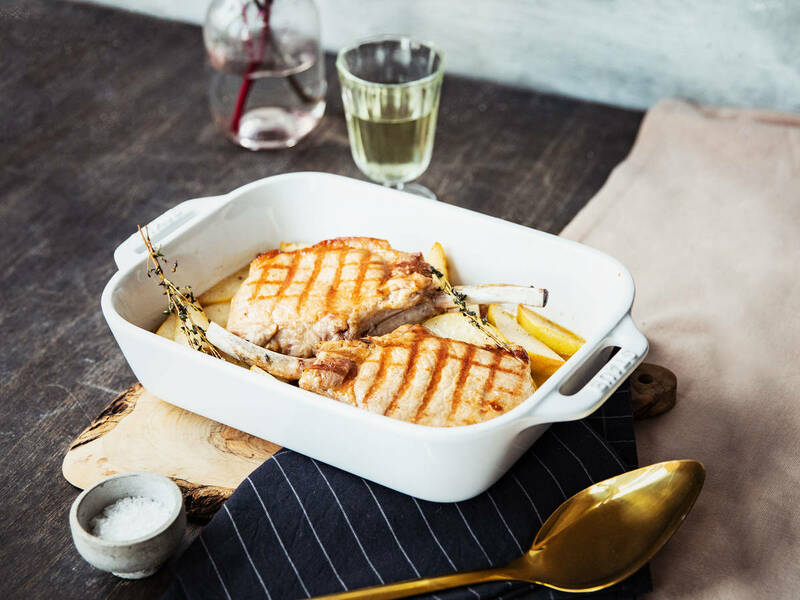 Place the pears in the bottom of a baking dish and place the pork chops on top. Transfer to a preheated oven and bake at 180°C/350°F for approx. 20 min. Remove and let the chops rest at least 5 min. before serving. Enjoy!